31-year-old Dean Cody stabbed David Kingsbury in Colwyn Bay. The judge called him "a committed criminal". 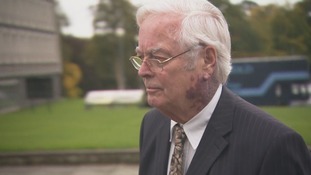 Gordon Anglesea, who was last month found guilty of indecently assaulting two teenage boys in the 1980s, is due to be sentenced today. In February, Ash Dykes became the first person to walk the length of Madagascar. But the trip almost cost him his life. North Wales Police searching for a missing man says a body has been discovered near Conwy. Emergency services were called at around 1.45pm today to forestry area near Nant Bwlch yr Haearn. He was pronounced dead at the scene and is yet to be formally identified. Earlier today an appeal to the public to keep an eye out for 63-year-old Philip Lloyd Evans who had gone missing from Colwyn Bay. Concerns are growing for a missing Colwyn Bay man who drives a distinctive MG car. Police have asked the public to be keep an eye out for Philip Lloyd Evans who is 63. He drives a classic red MG sports car with registration MG UMJ928W,. He was last seen wearing a navy jacket, jeans and a blue checked shirt. Anyone who spots Mr. Evans should call North Wales Police on 101. Parents allowing their little ones to spend a penny on potties in public have been hit with £75 fines – in a bizarre scam by a bogus council enforcement officer. Conwy council in north Wales said it had received reports of the fake officer handing out illegal fines at Colwyn Bay to parents for letting children use potties in public. “If you are approached, please do not hand over any money. Always ask to see an ID card and if in doubt contact the council direct,” the authority said. Kingdom enforcement officers in Conwy county do not, and have never, issued fixed penalty notices for urinating in a public place. Nathan Jeavons's girlfriend begged him to choose family life instead of drug dealing, court hears.